The constant technology evolution of action cameras has entered a new horizon leading to new and innovative ways of recording videos and taking pictures. Like the ThiEye i60e and the Firefly 6S, the Fitfort 4K is another Chinese manufactured action camera that costs less than a $100. It is small and lightweight which could be what you need to record and share high-resolution videos and photos of all your exciting adventures no matter what your favorite sport or activity may be. This camera boasts of several features that will bring out the best in your outdoors recording. The Fitfort 4K action camera is designed to capture your adventurous side. Whether you are skiing, hiking, bungee jumping, rafting or snorkeling, it can take the bumps with you. The action cameras and sports cameras are easy to use for even the most novice photographers. The Fitfort can be used anywhere, from underwater to freezing grounds, this camera delivers high-quality photos and videos with a touch of a button. If you’re searching for a cheap and reliable device that will give you a chance to be part of the action camera world, then FITFORT 4K action camera is for you, you might also want to have a look on other cheap action camera under $100. In this article, I’ll provide you with my Fitfort 4K action camera review. Walking out without the proper camera sounds like a disappointing experience as with any outdoor adventure that requires its moments to be captivated by pictures or videos. 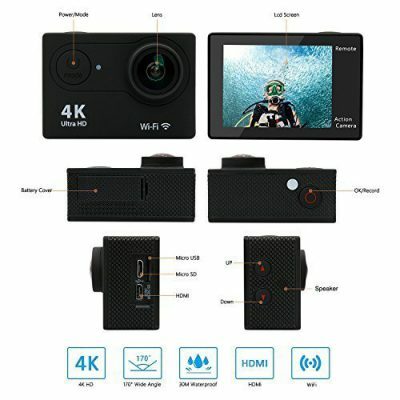 The FITFORT 4K action camera provides outstanding 4k HD quality, Wi-Fi connectivity to make it easy to share videos and photos online, remote control functions, wide-angle lens and all the accessories required to get some the best footage of your favorite outdoor activities. This camera is certainly one of the best action cameras for your wallet and experience. The 12MP Camera capable of capturing 4K videos and comes with two rechargeable 1050mAh batteries. It Supports recording HD videos up to 90 minutes with a 170 degrees wide-angle view. This camera comes with custom IOS and Android Apps (EZ iCam App) and supports underwater recording to a depth of 30m(100ft). It has a 2-inch LCD screen to preview your shots and change the settings. You will also get the waterproof housing, screw, and mount with it. The FITFORT 4K action camera is designed for both seasoned sports enthusiasts and beginners. It’s very comfortable in handling and use. It aims to capture amazing moments on the road, and even the darkest corners of the ocean as its high-quality build will allow your camera to live in even the most extreme environments with all these features are available at a low price. FITFORT is for extreme sports, and it has received nothing but praise. The camera openings are designed to prevent water from getting into the internal parts of the camera, so you shouldn’t need to worry about damaging the camera underwater. With massive success outdoors recording, you shouldn’t be left behind; buyers are confident of an action camera that is both durable and easy to mount on different surfaces. FITFORT 4K is a good camera with a higher megapixel rating and will take sharp and crystal clear pictures. It is small, lighter and easy to go camera. The action camera can be controlled by a wireless remote, and this remote is very small that you can put it in your pocket. This ultra-convenient feature comes in handy when one is diving, hiking or biking. This wireless remote improves the end shot especially when the camera is in hard to reach areas. If you have forgotten your remote, you can control the camera using ergonomic button placed on the camera itself. Most action cameras don’t come with a remote control since the companies can sell it separately and earn more but FITFORT has decided to include it remote, which is a great addition. Unfortunately, the 2-inch LCD is not touch so you need to use the buttons to select the options you see on the screen. This is expected from a cheap camera and honestly it’s not something I really care for. However, I would expect to have a touch screen in a more expensive camera. The outdoors video quality is sharp without any shaky, blurry videos. The FITFORT action camera employs some of the industries cutting edge technology that will bring out the best out of your videos with minimal editing. The inbuilt microphone has a noise cancellation feature that reduces wind noises while recording; this feature is quite handy when producing professional videos. Fitted with a 4K Ultra HD camera, you’re assured of capturing stunning videos. The high fps also reduces the shakiness nature of action videos. Large number Frames Per Second (fps) translates to more stunning videos and will appeal to your viewers. Videos are compressed using conventional video formats thus preventing headaches while editing them. It has a broad area angle view thus you can be sure of capturing the whole scene. This action camera has proven to be a game changer in capturing action videos. However when recording in 4K and like the other Chinese cameras, Fitfort won’t deliver the real 4K you see on the GoPro Hero5 Black for example. It provides a resolution of 2880 x 2160 instead of 3840 × 2160. The 1080p video settings can be set to record at 60fps or 30fps, and finally, 720p videos can record at 120fps. 25fps videos help reduce the shakiness of the video. The camera employs video stabilizing techniques while recording and further improves the stability by recording at high fps. Combine all of these excellent additions with a wide angle lens capable of 12-megapixel; you’ll relish every moment you’ll ever have in our outdoor adventure. You will never go wrong when you buy the FITFORT action camera. For photos, the FITFORT camera comes with some brilliant shooting modes such as burst mode, time-lapse[photo and loop-cycle recording. It is fitted with a 12MP image sensor and it produces sharp images. The wide-angle 12 MP cameras will capture nearly the entire field of view. It won’t produce the same ultra high-resolution images as you would normally expect from a high-end DSLR camera but it’s not bad in my opinion. The camera can be paired with the EZ iCam APP that is available on Android and IOS. Ez iCam APP lets you transfer photos and videos wirelessly to your smartphone. Easily control the camera and manage the videos & pictures on your phone. Save and share those moments anytime & anywhere. The last thing anyone doesn’t want is having his or her action camera dying on him or her in the middle of a moment. FITFORT action 4K camera come with two rechargeable 1050mAh batteries. Each battery is built to record a continuous video for up to 90 minutes; with the two batteries, you can capture video for 180 minutes meaning that you will never miss a moment. Therefore, if you were on expedition tour or multi-day backpacking trip, you’d want to keep additional rechargeable batteries with you all the time. Packed with lots of features, it’s impressive the moment it lands at your doorstep to the moment you unbox it. This camera also comes with an assortment of accessories such as a waterproof case, seven mounts, five tethers, lens cloth, travel bag, and much more. All these accessories are designed to improve the recording experience. 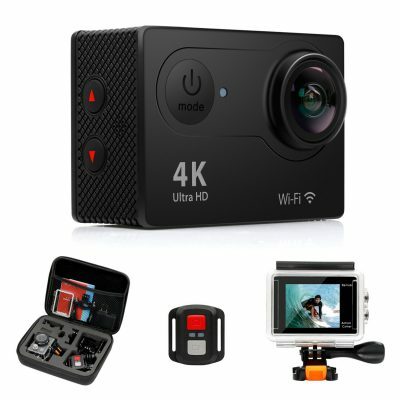 Everything you need for this action camera is already included; except the MicroSD memory card that you have to buy separately. This camera will save you a lot of money since action camera accessories are not that cheap. A manual is also provided and will guide you on how to use the camera. FITFORT 4K Action Camera is enjoying massive success compared to other Chinese action camera manufacturers. Thanks to its long-lasting battery, users can capture unending action videos. If you’re looking for a cheap action camera and you don’t mind the fake 4K it provides then the Fitfort won’t disappoint you. It’s easy to use, produces high-quality results, and is a worthy investment. The video quality is good, it has a quality build designed to withstand falls and protect the inner components of the camera.